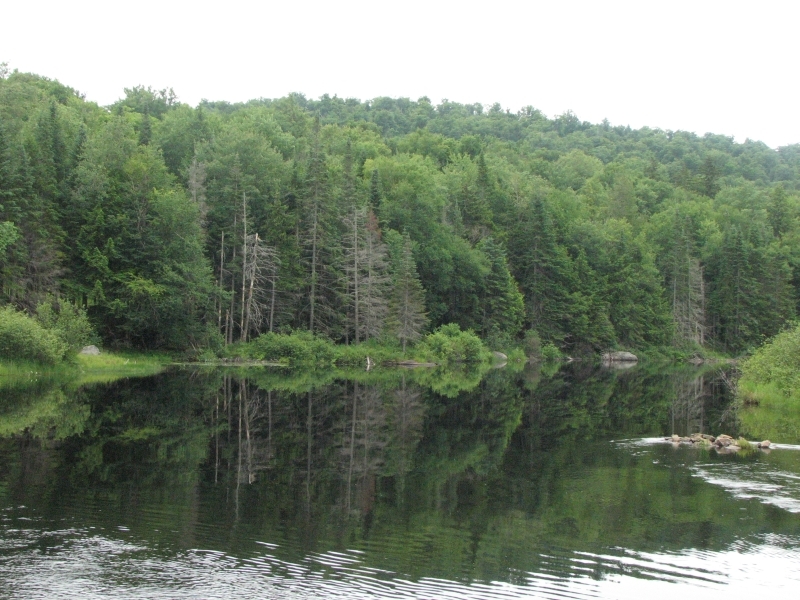 We headed into the southern Adirondacks to a campground at Lewey Lake where Jim camped when his kids were young. It was larger than he remembered, but otherwise hadn’t changed much in 30 years. The sites by the lake were taken, but we found a quiet site next to the outflow stream. Jim and I stopped on the way to do a one mile loop hike to powerful Auger Falls. The trailhead was totally unmarked. Fortunately we ran into a family at the parking area who reassured us that we were, in fact, at the right place. The maps are frustrating because they show approximate locations for trailheads, but not the trails themselves. 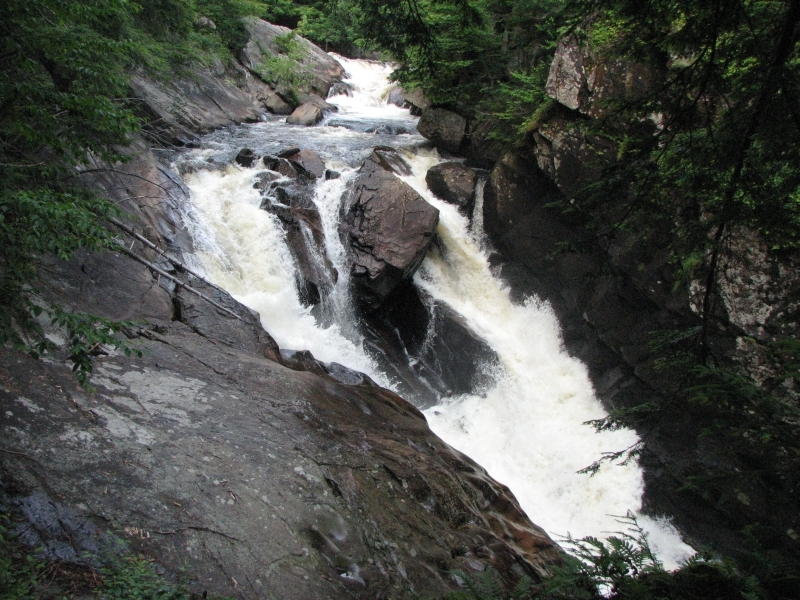 The tourist literature describes some of the short hikes like Auger Falls, but lacks detail as to how to find the trails. The assumption is that you have guidebooks and/or trail maps. We usually find what we’re seeking eventually, but it isn’t always easy. It was a nice short hike through lush green woods and the waterfall was beautiful. I’m glad we found it. Today we headed out to do a short hike and scenic drive, but it was gray and looked like it was about to rain, so we decided to visit the Adirondack Museum instead. The museum was interesting and took all day. Even so, we only skimmed the surface. I especially enjoyed a collection of quilts that was a special display but there were a lot of good exhibits about the history the region, especially after it was discovered by those who wanted to escape the cities for a wilderness vacation. There were lots of carriages and sleds and boats, displays about logging and tourism, an incredibly luxurious train, cabins and camp furniture, etc. It was worth the $16 admission. We stopped at a nearly empty restaurant for lasagna, then returned to the campground to discover that someone stole the chair and water bottle we had left to mark our campsite as occupied. That was irritating. I went for a short walk before dark, but as it was late and still threatening rain, I didn’t go far. I’m feeling frustrated at the moment. Not being able to hike is driving me crazy. I know there is supposed to be great hiking here in the mountains, but Jim can’t do it so I don’t get a chance to explore very far either. We talked about coming back to do the Northville Placid Trail in the fall, but what are we going to do until then? Driving in the east isn’t spectacular like western scenic routes. The road is either developed, with lots of houses and strip malls, or it is a long green tunnel through the forest. We get occasional glimpses of lakes and ponds, a heron or a duck, but there are few spectacular vistas to be seen from the road. I feel like we’re just marking time, and I hate that. We have no plans, no goals, no reason for being here instead of someplace else. 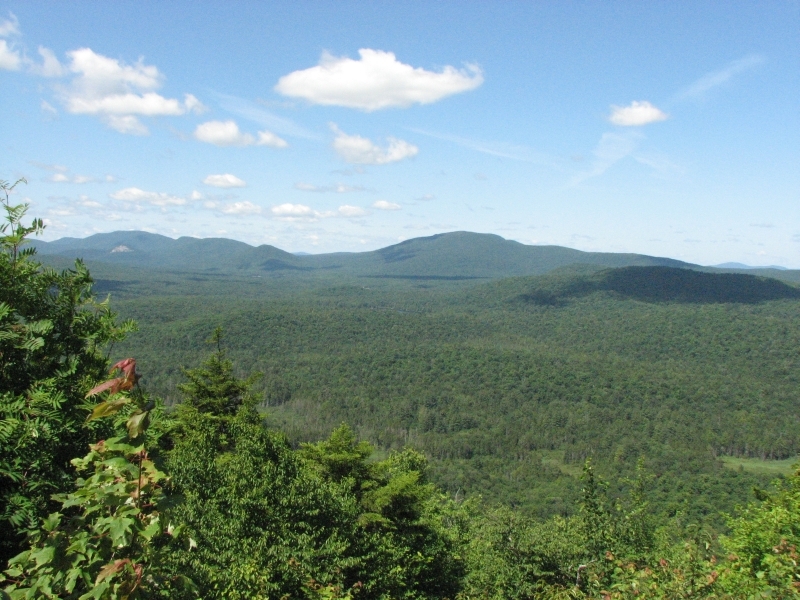 I feel frustrated because there are so many things I’d rather be doing than just driving in circles through rural New York, but if Jim can’t hike, I’m stuck with sitting in the car driving from place to place or reading at a campground. Grrrr! 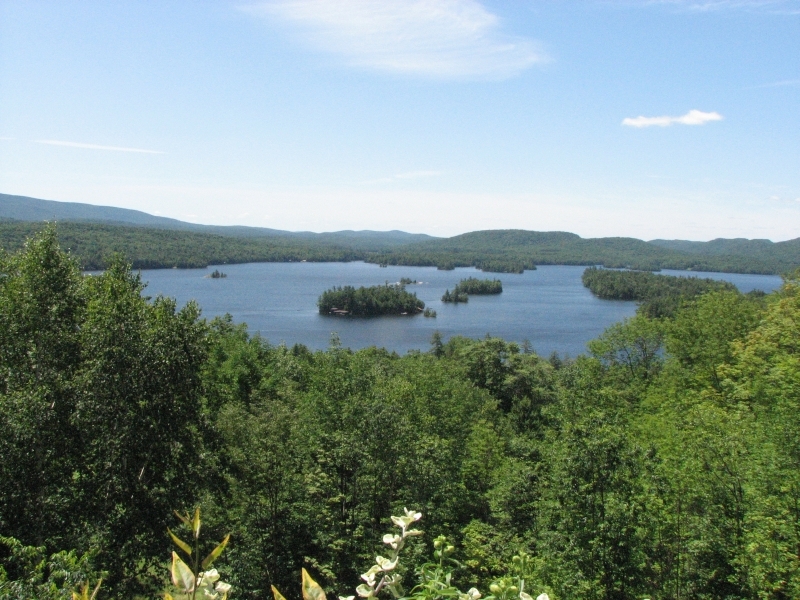 Heading west, we ended up at Limekiln Lake because it has hiking trails – either a 1 ½ mile nature loop around a pond or three miles to a waterfall. We did the nature trail, to spare Jim’s leg and foot. Yes, now his foot is hurting too. A warm shower was very welcome, then we sat in the sun at our campsite by the lake. It’s a pretty place, peaceful. 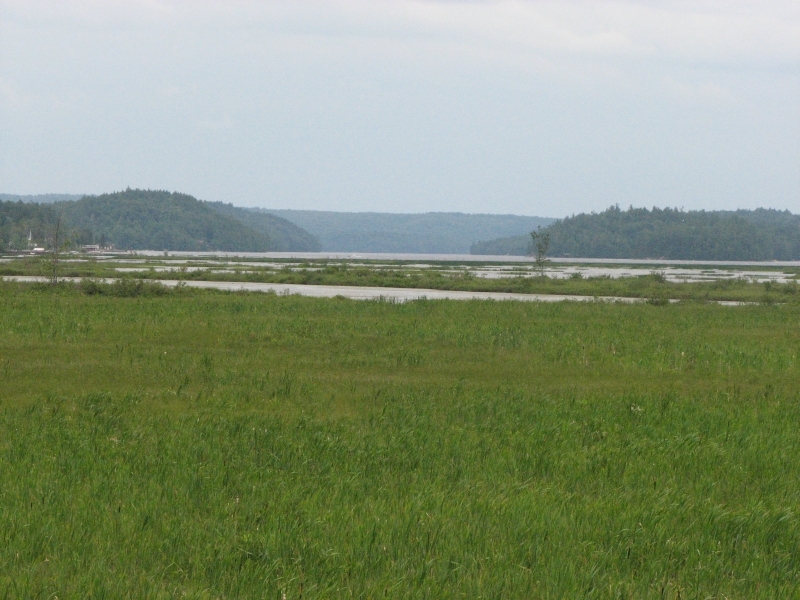 There are lots of empty sites, though there are a lot of canoes and kayaks on the water. We woke to dark skies, wind, and scattered showers. Although we had talked about renting a canoe, today wasn’t the day for it. 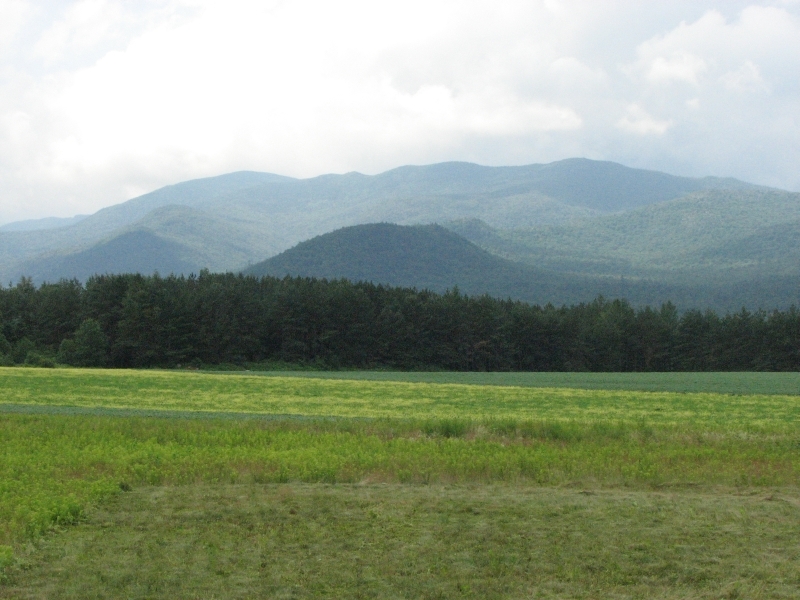 Instead we did a long drive through the western Adirondacks along a river, through woods, past farms and fields, then back into the hills again. Lunch was at a picnic area a mile off the highway. There was supposed to be a nature trail nearby, but if so, it wasn’t obvious. Another waterfall was worth the detour, however. We stopped for the night at Cranberry Lake Campground. It was more crowded than the last two we stayed in, but we found a nice site away from the lake. I enjoyed our site on the water last night and was surprised at the number of empty sites along the lake until we learned that there was a bear that makes regular visits to those sites. Last night the rangers decided to try to scare it off, so we never saw the bear. Darn! We did hear the mournful call of several loons. I love the sound of loons on the water. I wanted to do a hike this afternoon, since the rain was holding off, so we did an out and back hike through the woods. The main campground trail goes over Bear Mountain and is supposed to be quite strenuous, so we chose a flat alternative instead. The trail was very wet. 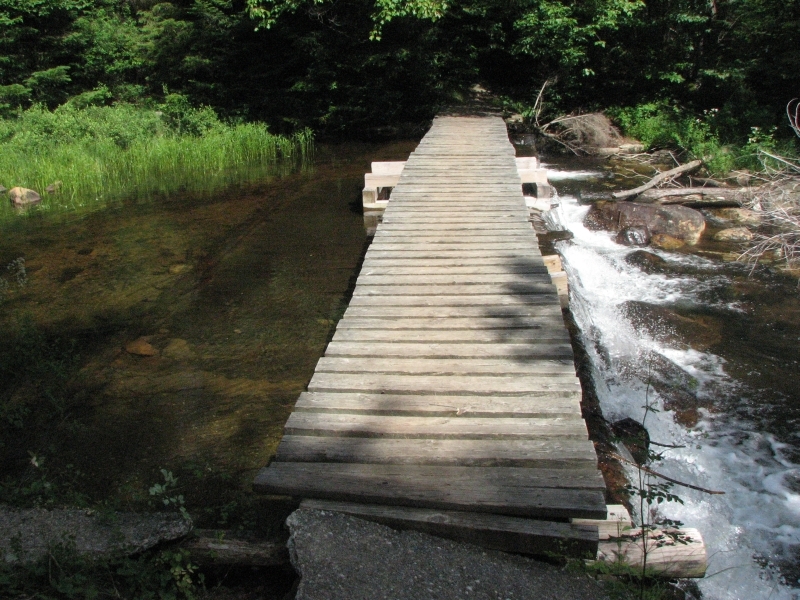 They had built boardwalk through some of the wet areas, but there were a lot of places that were an effort to bypass. One of the boardwalks was four inches under water for about 20 feet and another bridge had washed out completely. I turned around there rather than wade the knee deep creek. 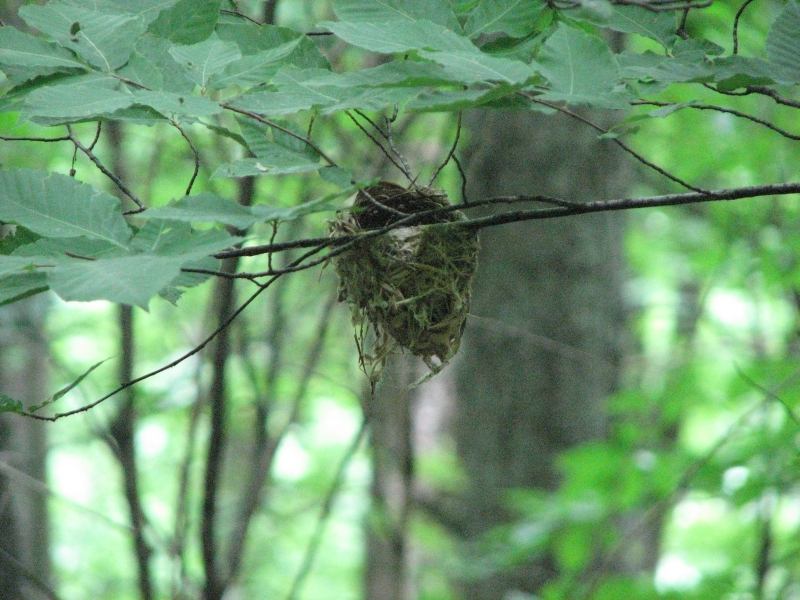 Still, I enjoyed the mixed forest – hemlock, maples and birch – the fragrant lush ferns, the frog and deer we saw. It was an easy hike, aside from the bog, and I had fun. Jim’s foot was bothering him so he turned around midway, but I’m glad I hiked as far as I could. Another non-hiking day. We woke in the middle of the night to a torrential thunderstorm. When we woke the forest was soaked. I had intended to hike up Bear Mountain, but didn’t want to deal with a wet steep trail first thing in the morning. 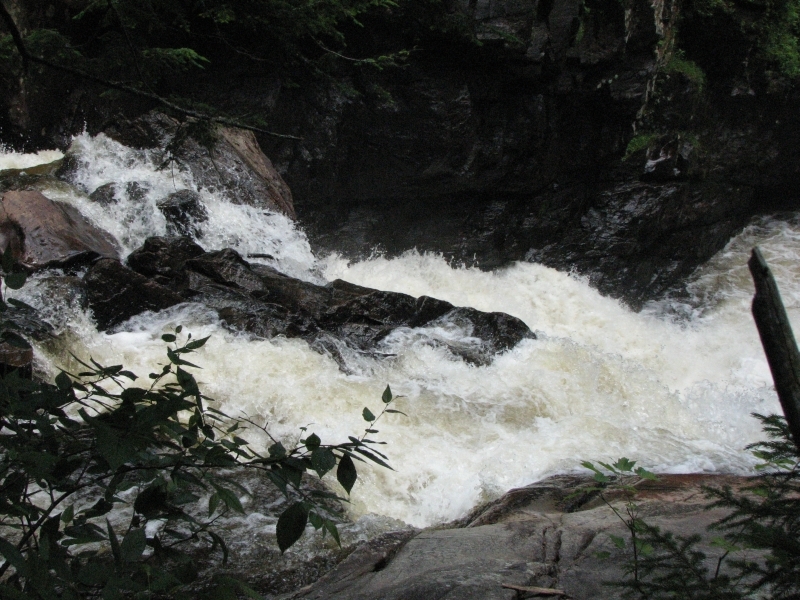 Instead we got in the car and drove east to a campground between Saranac Lake and Lake Placid. It’s not a great campground, with a train track on one side, highway on another and a busy bar/restaurant on a third. However, it’s centrally located and had empty spaces which was all we needed. This area gets quite busy on weekends. We saw full parking lots at boat launches, trailheads and fishing areas. There were even several motels that showed “No Vacancy” signs, which we haven’t seen much lately. This area is showing signs of the recession: empty campgrounds and hotels, and a lot of homes for sale. Some are quite nice, but I still don’t want to live in New York. We got a campsite, then drove to the nearby town of Saranac Lake to use a library computer. We had to wait, then were allowed only 45 minutes online. No news on the passport yet. 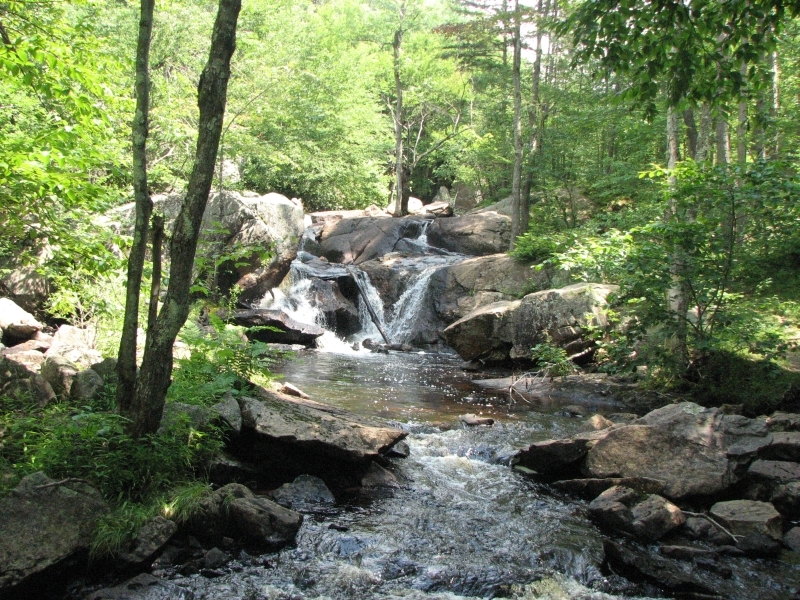 We ate lunch at a picnic spot overlooking a marsh, then drove south to Buttermilk Falls: a dramatic waterfall, not terribly tall, but wide and with a lot of yellow-brown water. It was loud. 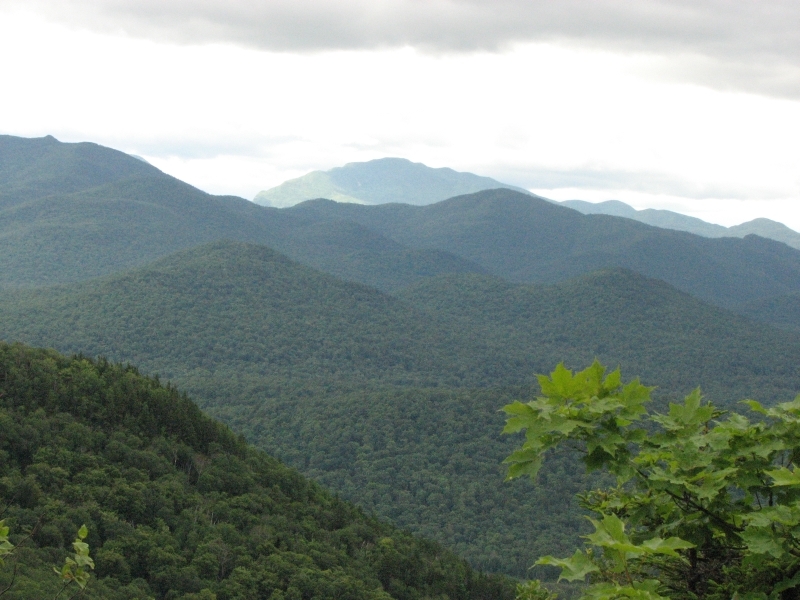 We decided to drive a loop through the forest and up into the High Peaks area. There were some pretty rocky cliffs and lakes. We saw a bison farm and lots of small towns with a nice mixture of old houses and brand new ones. After pizza for dinner, we returned to our noisy camp. It stayed dark and cloudy all day, but only sprinkled a bit from time to time. Hiking wasn’t appealing. I enjoyed the drive but hope tomorrow will be nicer so we can spend some time outdoors. The forecast calls for thunderstorms every day for the foreseeable future. It seems like such a waste, to be in the mountains and only able to see it by car. Last year I didn’t mind as much because it was such a long way to Alaska. Plus the weather was both colder and wetter. Here we could hike, but we aren’t. We just drive in circles or read in the car. I spent Wednesday deeply depressed. Yesterday was better because we did manage some hiking, even if it wasn’t far. Today was okay because we saw some interesting new country, but I do wish we were really hiking and not just getting in short walks every few days. I know I could go without Jim, but he hates it when I do. He gets upset at not being able to do what he really wants to do too. I’ll do some short hikes alone, but nothing that he’d really regret missing. Jim has been resisting the idea of taking to the water. I don’t know why. I can suggest we rent a canoe, but can’t force him into it if he isn’t interested. A leisurely day. It rained again overnight and the world was drenched when we arose at 9:15. 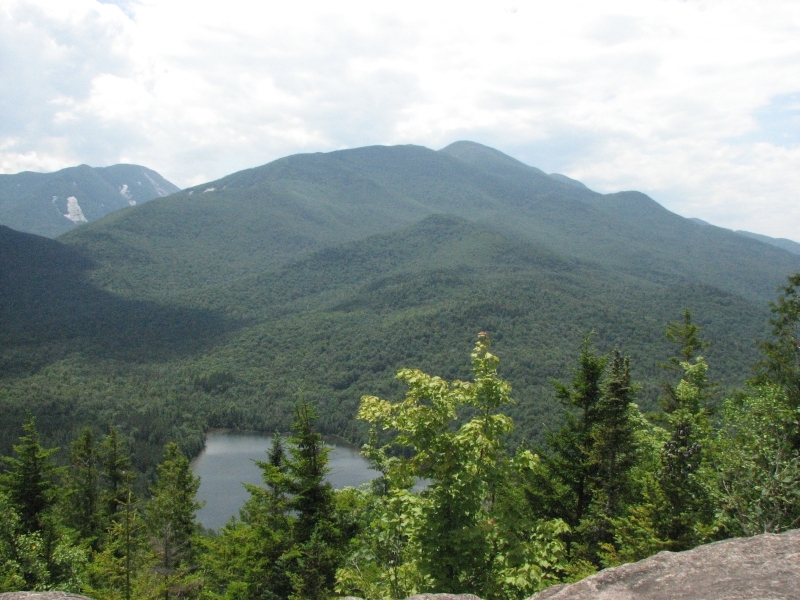 We took our time over breakfast, but eventually headed to Adirondack Loj to do a short loop hike over Mt. Jo. It was a very nice walk to a rocky outcrop with good views up into the High Peaks Wilderness. 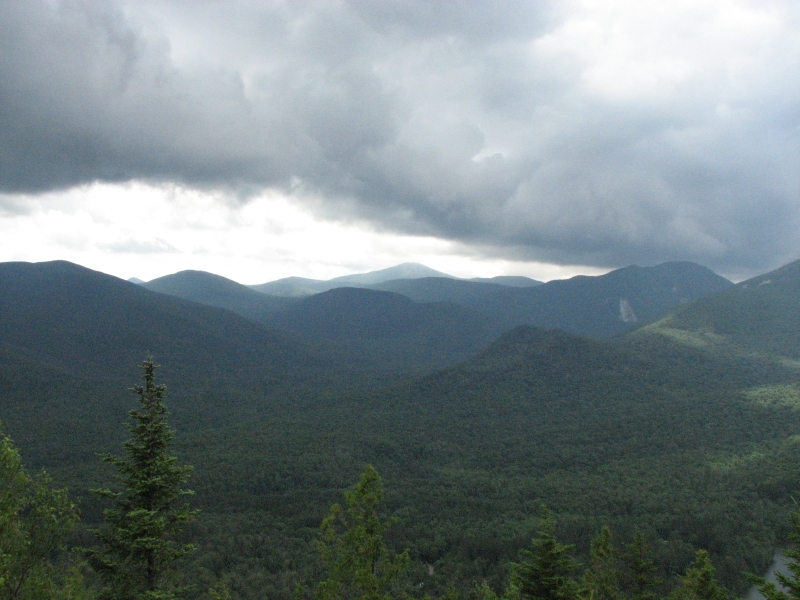 Dark clouds surrounded us as we climbed, but cleared while we were enjoying the overlook. We could see Mt. 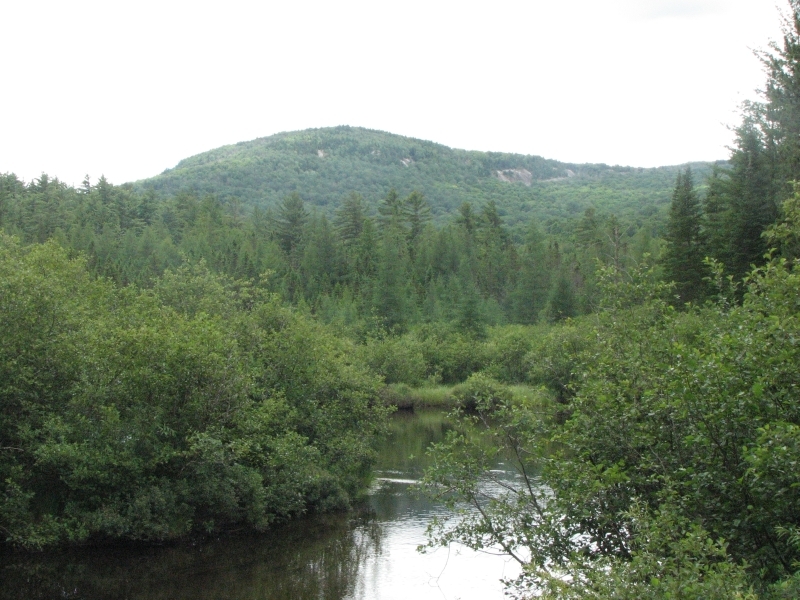 Marcy, Algonquin, etc. from our perch, as well as a couple of lakes below us. The trail was rocky and eroded but not too hard a climb. We talked for a while with the AMC intern who acts as site steward, answering questions about the area. There were a lot of families on the trail, and a group of kids that were doing a lot of hikes in the area. After lunch back at the car, we drove a loop to Keene, Jay and Lake Placid, then back to our campground. It was a shorter loop than yesterday’s 300 mile journey, but enjoyable. 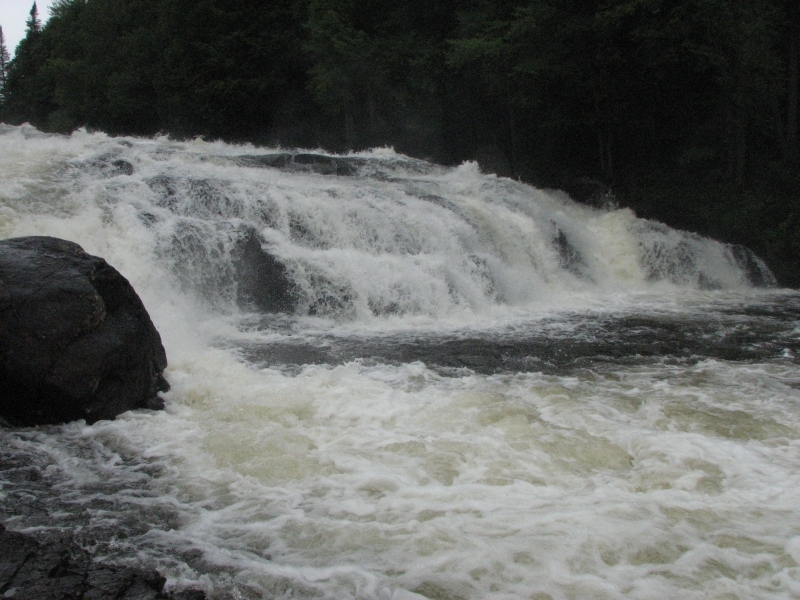 I hoped for views of Ausable Chasm but it was only a rocky river where we were driving. Lake Placid was a busy tourist town, pretty in its way, with numerous motels and restaurants and shops. We stopped at North Jay to check out a library book sale with many familiar old books, then picked up some chicken at the grocery to grill back at the campsite. It wasn’t as well done as I like, but it wasn’t awful. A hot shower was a highlight of my day, though the poison ivy on my legs made washing difficult. I’m not sure where I picked it up, but it keeps spreading, little by little. There is a seven mile trail out of the campground that leads to a nearby mountain called Scarface that I decided to hike this morning. There was some confusion when the trail reached the railroad tracks, since it wasn’t apparent which way to go. I went the wrong way, of course, but turned around and eventually found the trail into the woods 100 yards in the other direction. Evidently you can either access the trail in the park or at a trailhead ½ mile outside the park. 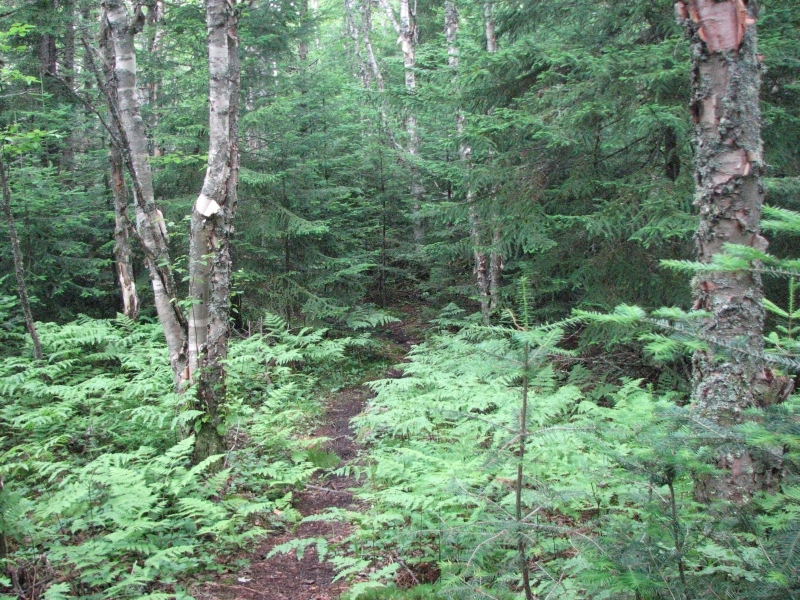 The first half of the trail was an easy pleasant walk in the forest. Soft pine needles covered the path. After about 40 minutes, I reached a stream and began to climb. I’m out of shape right now, so I felt the effort more than I expected. Soon afterwards, the trail got really steep as I scrambled up wet rock ledges to the ridge. There were partial views through the trees of mountains and lakes nearby, but nothing really exceptional. I was hoping for clearer and wider views, so kept following the trail more or less on the level for another mile or so. There never was a good vista. The trail just ended at a high spot in the woods. I turned around and slid back down the mountain. I had the trail to myself until I was halfway back, when I met a couple with a dog near an old ruin. Jim came up the trail to meet me, worried because the hike had taken so long. I wasn’t moving fast on the climb or descent and the easy trail at the bottom didn’t quite make up for my slowness on the steep sections. I wish Jim had been able to join me this morning for the whole hike. Since he didn’t, I’m glad I went without him. I rarely do. There was intermittent black skies and sunshine, but it never did rain. I wanted to hike until I was tired, and that I did accomplish. It was a good hike and I feel happy again. Jim and I headed to town for a late lunch, then wandered in circles looking for a laundromat to wash our wet muddy clothes. It’s always good to have that chore finished for another week. Ice cream made the wait for the wash to be done seem short. 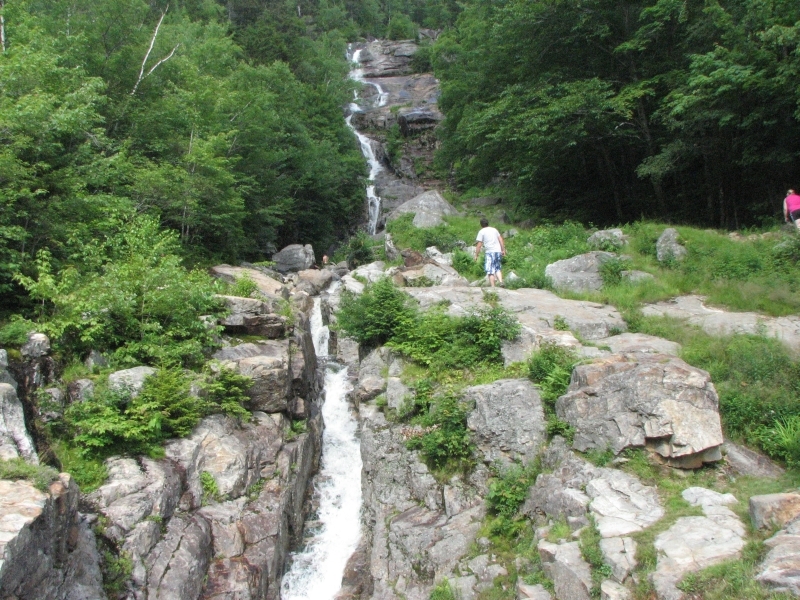 On the way back to camp, we stopped for a short walk on the Haystack Mountain Trail. It wasn’t as nice as my trail this morning, being steeper, more eroded and much muddier. But at least Jim got to walk a couple of miles. It was a beautiful clear summer morning as we headed east to Lake Champlain. The round green mountains invited us to climb them; the blue waters invited us to swim or paddle; several waterfalls invited us to stop and admire their beauty. 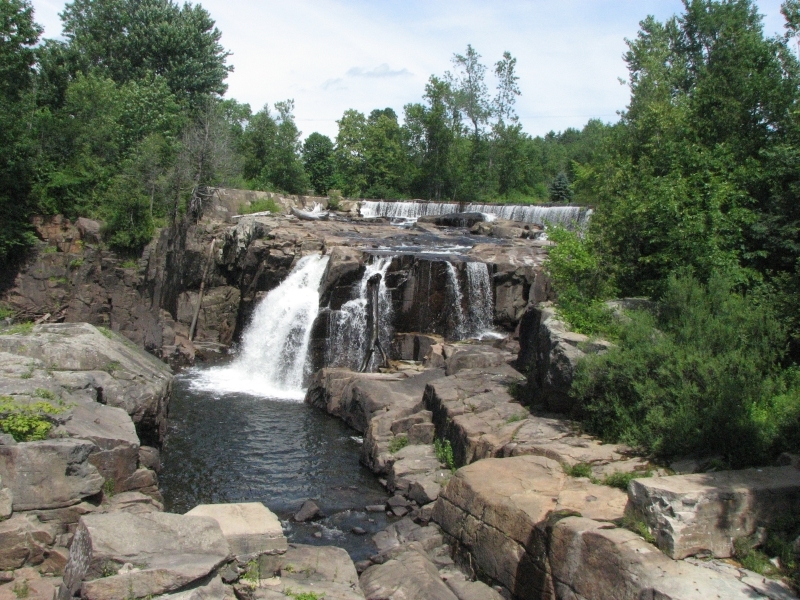 We did stop to photograph two of the waterfalls and we have a mental image of a beautiful still reflection on the Ausable River near one cataract. 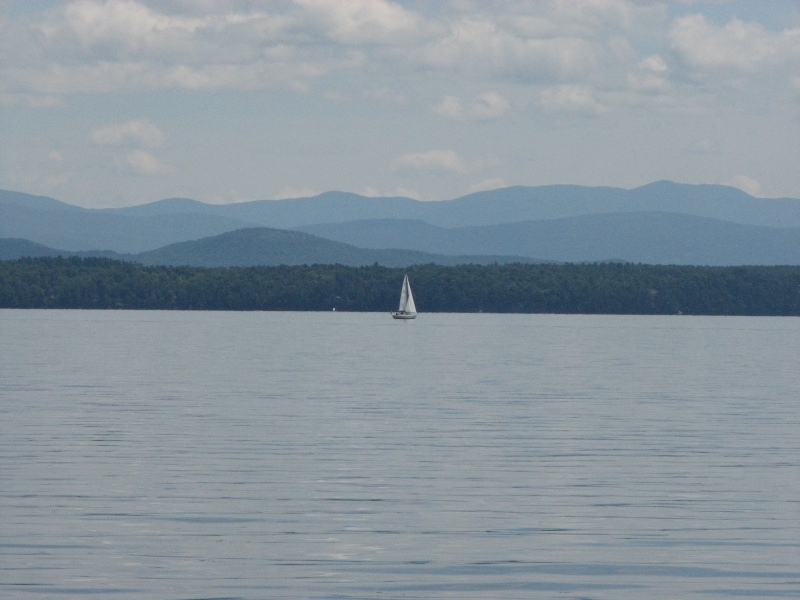 We ate lunch overlooking Lake Champlain, where a few sailboats and motorboats attracted the eye while Vermont’s Green Mountains rose clearly in the distance. Since we’re both history buffs, Jim and I detoured to Crown Point, site of an 18th century French fort that was captured by British and Colonial troops, then was replaced by a huge British fort that was destroyed by fire before it was completed. The walls of the officers and enlisted quarters are still standing. 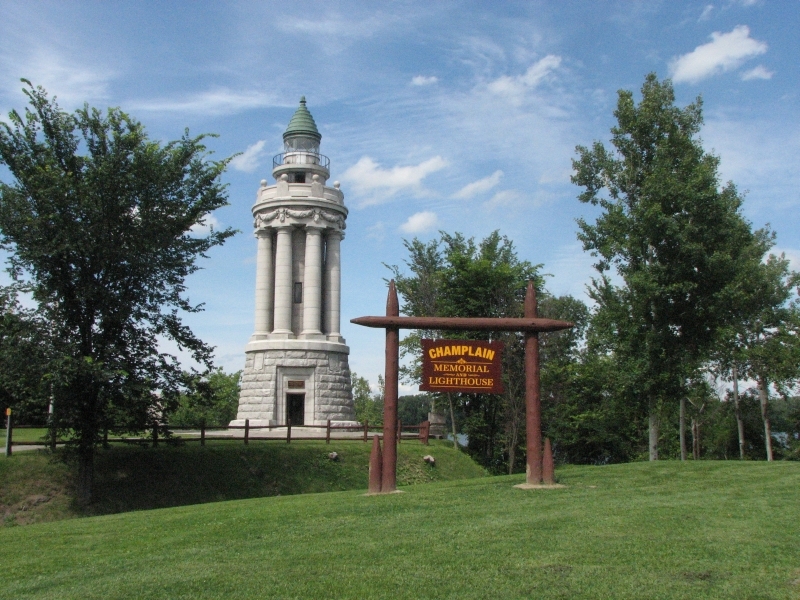 There was a film in the museum that explained the site’s historical importance during the French and Indian Wars. 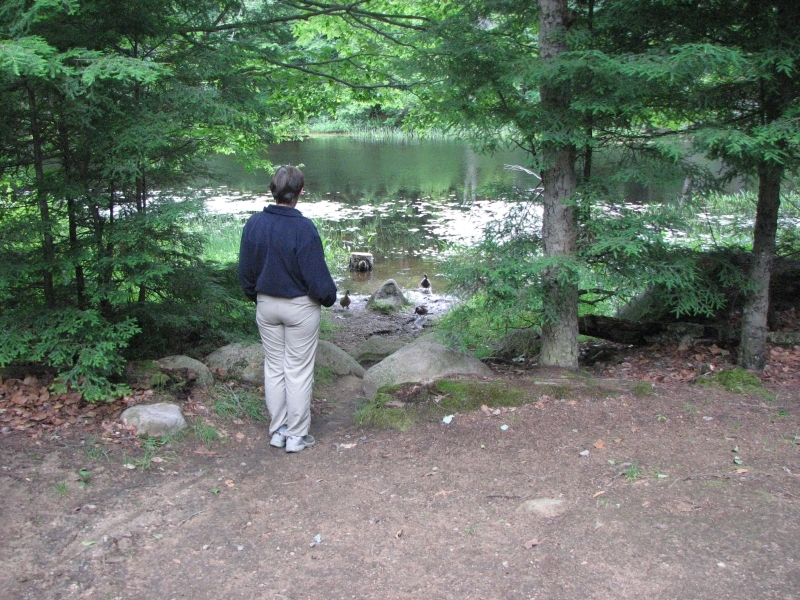 We ended up at Putnam Pond Campground in a nice site hidden in the trees. 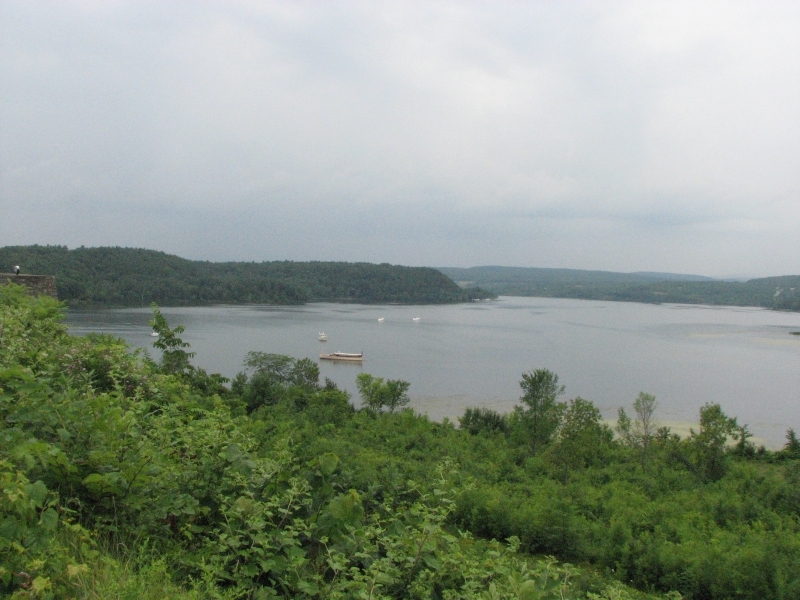 There are several hikes nearby as well as Fort Ticonderoga, so we’ll stay here a couple of days to explore the area. A gray day, but dry when we awoke. We decided to take advantage of that respite to do a hike out of the campground that led to several nearby ponds. I did a five mile loop while Jim hiked with me as far as Rock Pond before turning around. It was an easy hike, though the wet trail slowed us down in spots. We saw several frogs, a couple of orange newts and snails, but no large animals. I had the trail to myself until the last ½ mile. 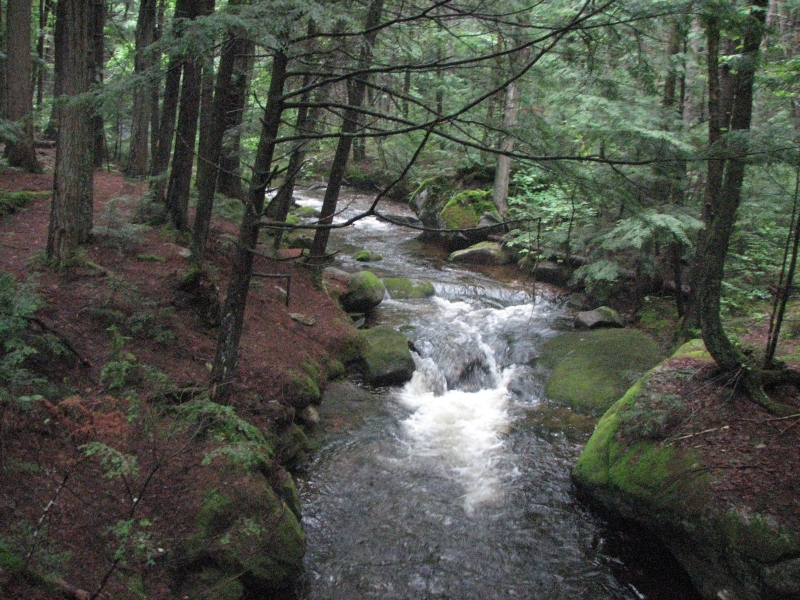 It was a fun walk in the woods, listening to birds and flowing water in the many small streams. 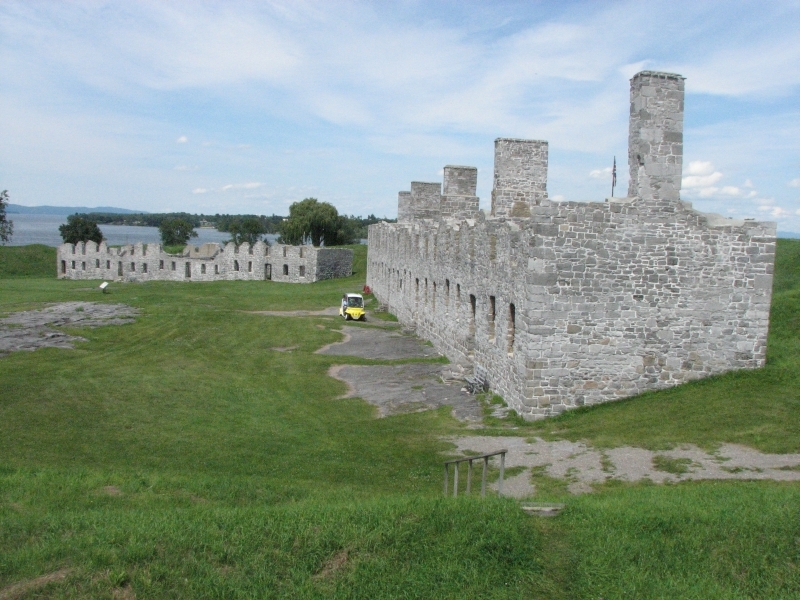 After a quick sandwich, we drove to Ft. Ticonderoga, a reconstruction of the fort built in the 18h century which was much fought over by the French, British and Americans. It was a busy place, despite the $15 entry fee. 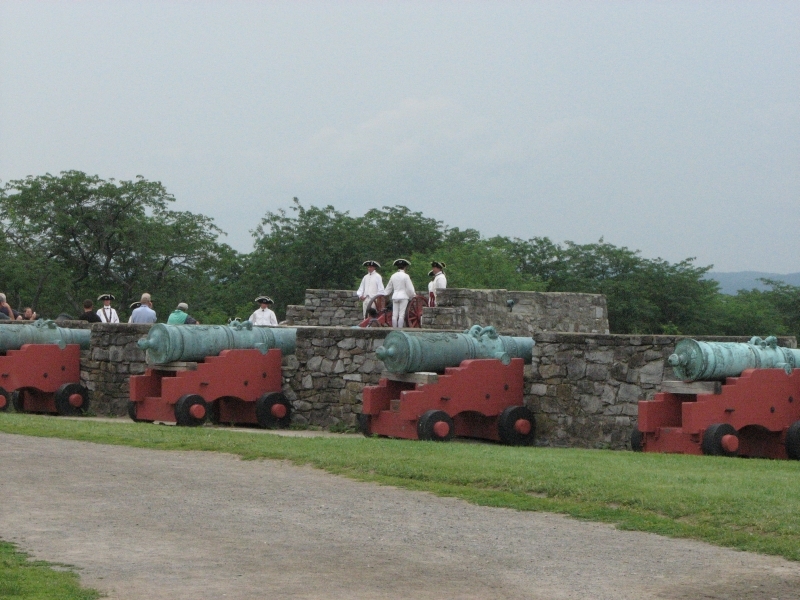 The Pell family did an amazing job rebuilding the fort, given what little remained when they purchased it. There was a good museum, a film that repeated what was described in the museum, and a lovely garden area. It started to rain soon after we arrived, so I was happy to be inside the museum, warm and dry. 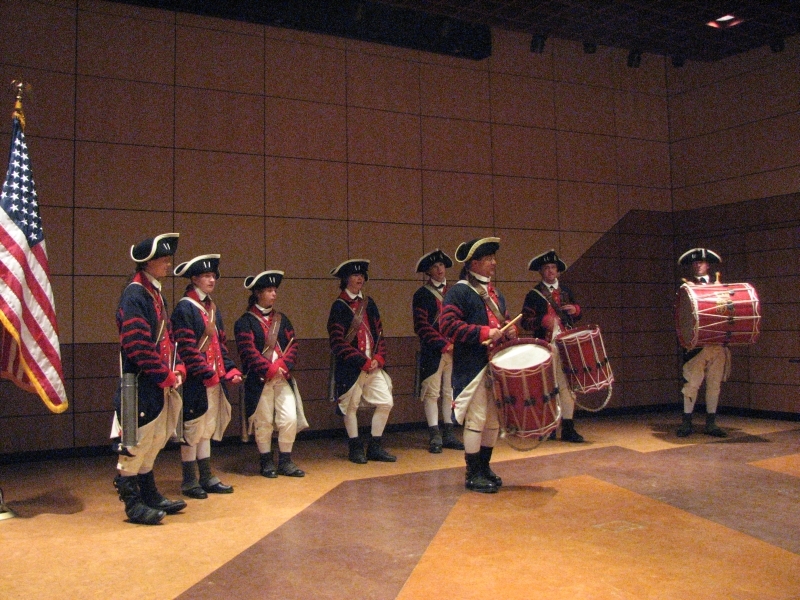 We enjoyed a brief performance of the fife and drum corps, though it was a bit loud for an indoor venue. 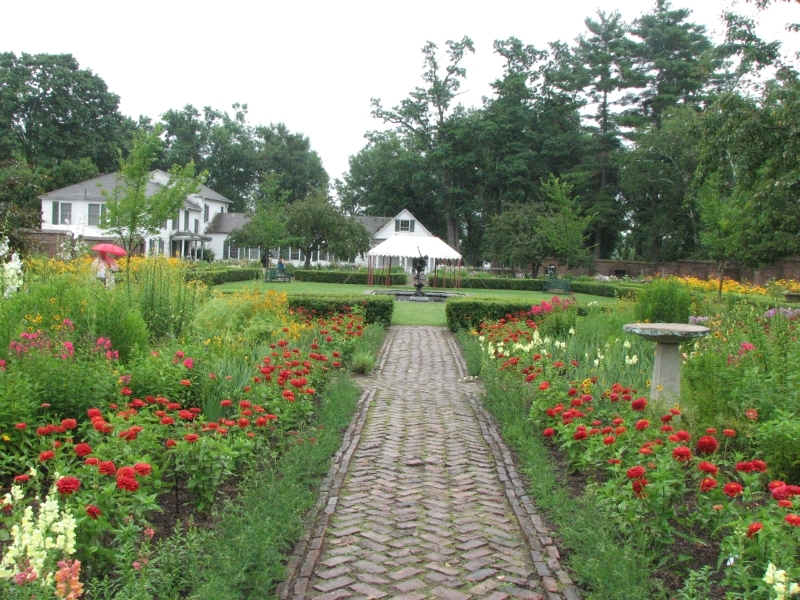 We didn’t linger in the garden, but I did enjoy seeing the beautiful display of flowers. We were hungry, so we ate an ice cream before grocery shopping at WalMart. I didn’t want to cook in the pouring rain, so we ate dinner at a diner, a nice change. It rained off and on all night and we woke to more clouds and mist. Rather than deal with the damp, we jumped in the truck and drove to MacDonalds for breakfast then headed south along Lake George, listening to a course on tape. We’re listening to a very good series right now on world religions. I know very little about Hinduism or Zoroaster, so I’ve really enjoyed the lessons. Today’s discussion was especially intriguing, but most of them are worth the time and money. It’s nice to keep the mind occupied while we drive. Jim and I discuss what we’re learning, and the miles pass quickly. Lake George was a much bigger tourist area than I expected, with dozens of hotels, lodges, outlet stores and tourist shops. 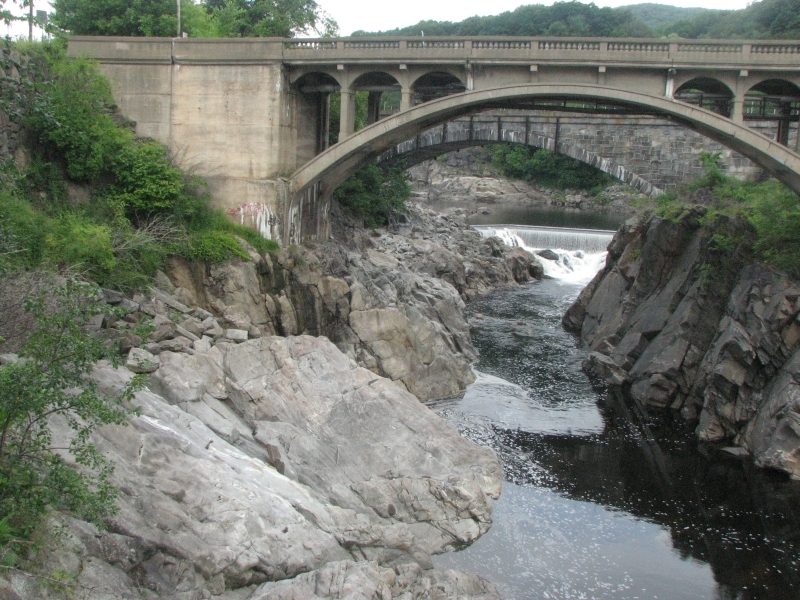 We finally left New York for Vermont, where we intend to look for a petroglyph site along the Connecticut River. On the way east, we stopped at the Inn of the Long Trail for old times’ sake. We stayed there one rainy day when we were thruhiking the AT. Today we were served beer from the bottom of the barrel – nasty – but they were willing to replace it when I complained. 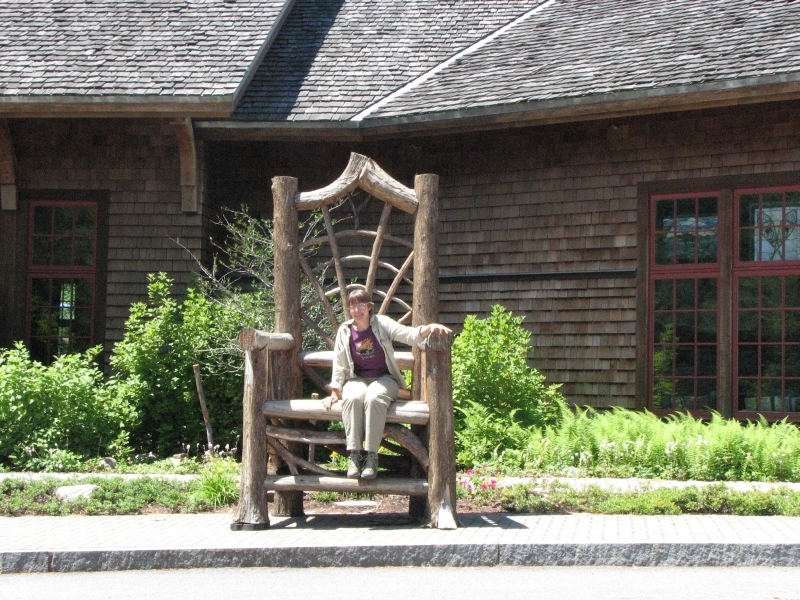 Later we visited the Vermont Country Store, the New England equivalent of Wall Drug in South Dakota. 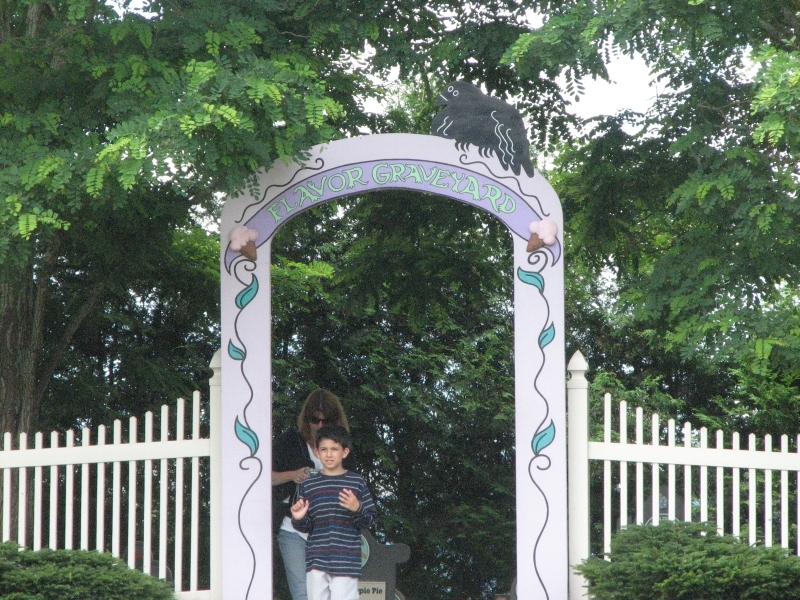 Actually, for a tourist trap it was kind of fun. I especially enjoyed tasting various cheeses, fudge, apple butter salsa, chutney, etc. Products were interesting but prices were high, so we left without buying anything. We did pick up more books at another library book sale (I love those) before stopping for the day at Jamaica State Park. The campground has many shelters as well as tentsites, like the one we stayed at in southern New York. The sun came out late in the afternoon, so we went for a short walk along an old rail trail before dinner. 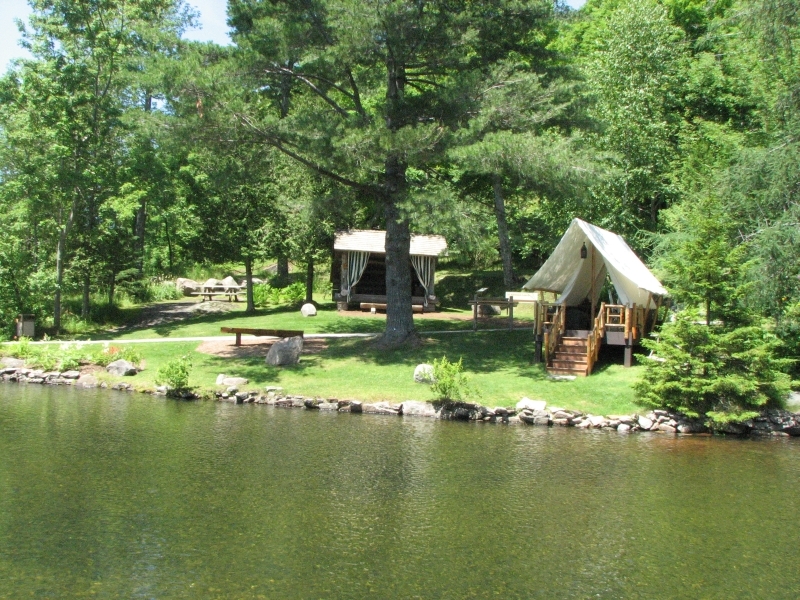 It’s a small campground, with sites that are close together, but nice. My passport is finally on its way, so we’re heading north to meet it on Friday or Saturday – or Monday if we’re not lucky. Michelle is mailing it from home to Gorham, NH. I’m excited to finally be on our way to Canada – well almost. I’ve enjoyed our leisurely trip so far, but I’m looking forward to increasing the intensity. Mellow is good for a while, but not forever. 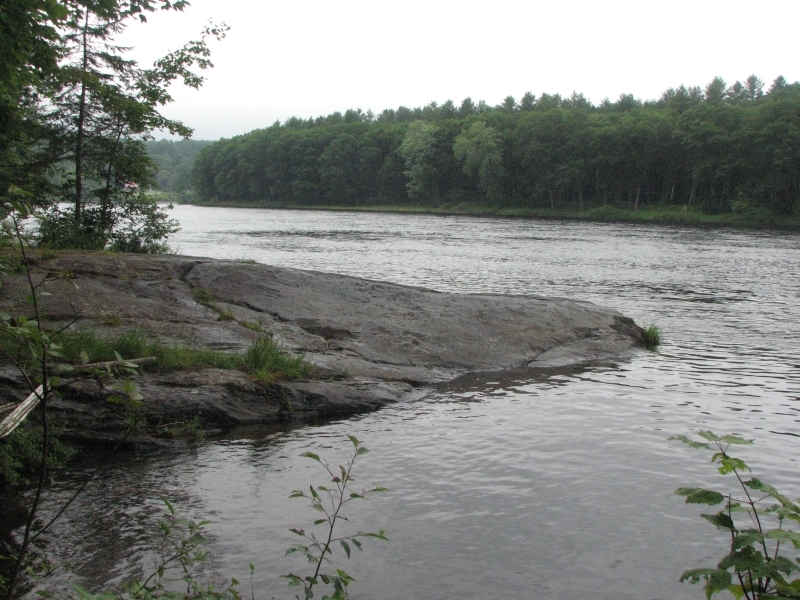 Vermont has a petroglyph site along the Connecticut River at Bellows Falls that sounded easy to find, so we headed there first thing this morning. It’s an odd site in that the images may be mostly modern. Evidently there were images carved on rocks that were described when the area was first settled by the English, but they were supposedly recarved in the 1930’s to make them more visible, and several new faces were added. 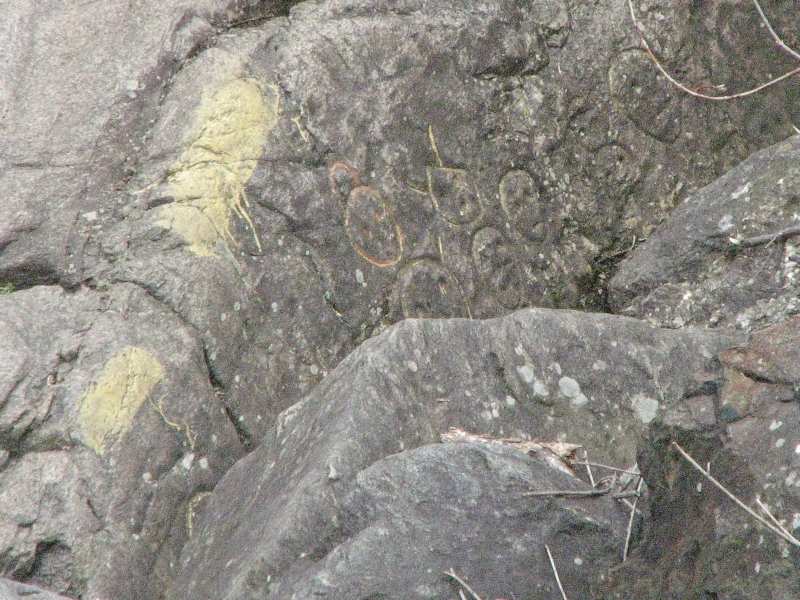 We climbed down to the rock we thought they were on, and found what looked like faint carvings. Then we climbed back up to the bridge over the river, looked down and saw the many faces that we were really looking for quite clearly. Not only were they recarved, but there was paint outlining some of them as well. Oh well. At least we found them. The book we found on New England petroglyphs says that the others in Vermont are either no longer visible or the directions are impossibly vague, e.g. 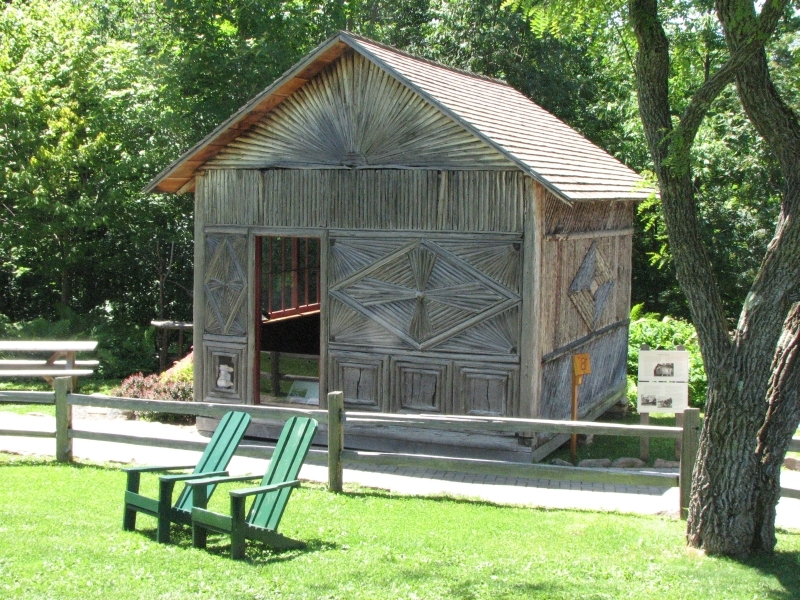 “The Evans Farm”. 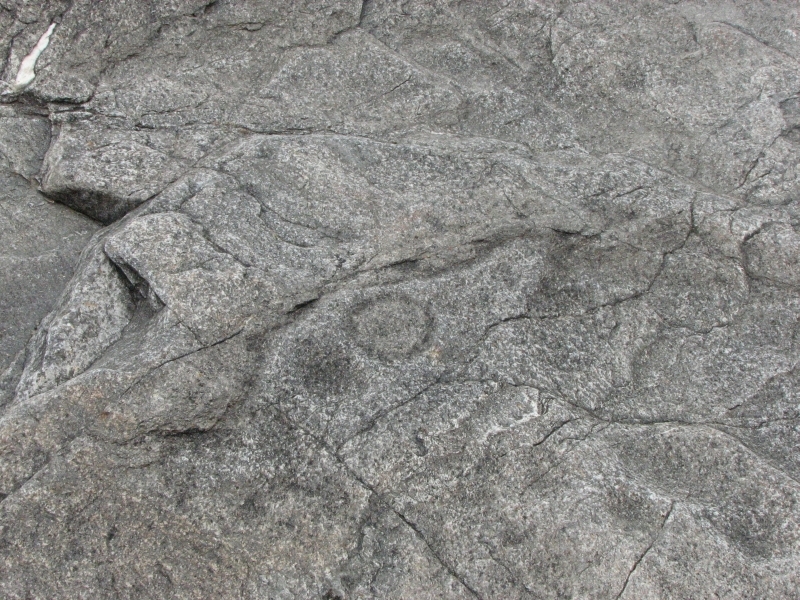 A few petroglyph sites have only a single image, i.e. a carved fish or hand, and I don’t think it’s worth detouring for miles and searching high and low for a single image. Especially since many of the carvings seem to be fairly modern. I was spoiled in Utah, where the Anasazi images dated back 600-1000 years, and the Barrier-style ones went back 2000 years or more. We drove north on back roads through rural Vermont. It’s a pretty drive. There are a lot of beautiful old Victorian mansions and neat little towns. We stopped at a couple of bookstores, but didn’t buy much. Jim wanted Internet access, so we got a room at a motel in Montpelier – Barre for the night. All in all, a good day. We continue our leisurely back roads wandering. On Friday we stopped at the Ben and Jerry’s Ice Cream Factory for a quick tour and taste of a new flavor, then headed to New Hampshire. On Friday, we stopped at the post office in Gorham to look for my passport, but it hadn’t arrived yet. We ran into an old friend, Red Wolf, walking through town, so we stopped to say hello, then drove out to Moose Brook State Park a few miles from town for the night. 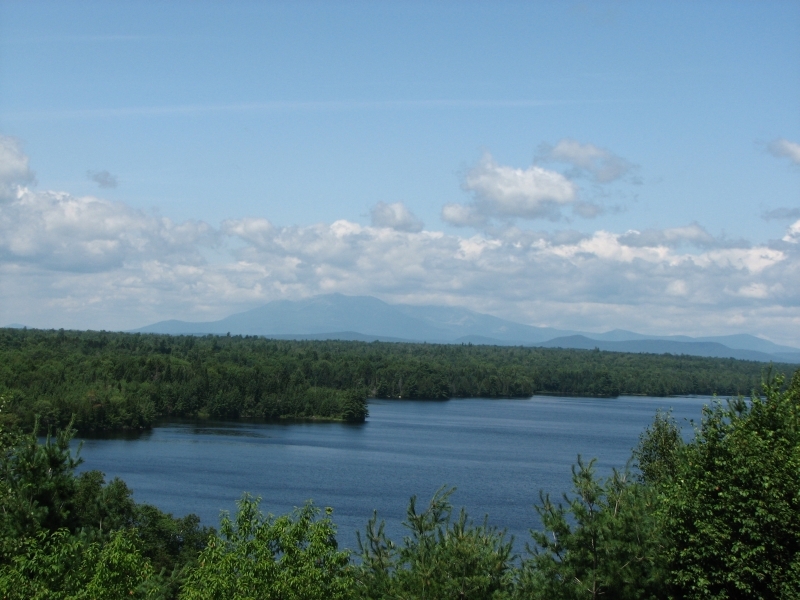 New Hampshire is more expensive than either Vermont or New York for camping and you have to pay for the shower – only a quarter, but still it’s strange after the nice free showers we ran into at the parks in Pennsylvania and New York. Saturday we returned to the post office, found the passport waiting for us, (Hurray!) 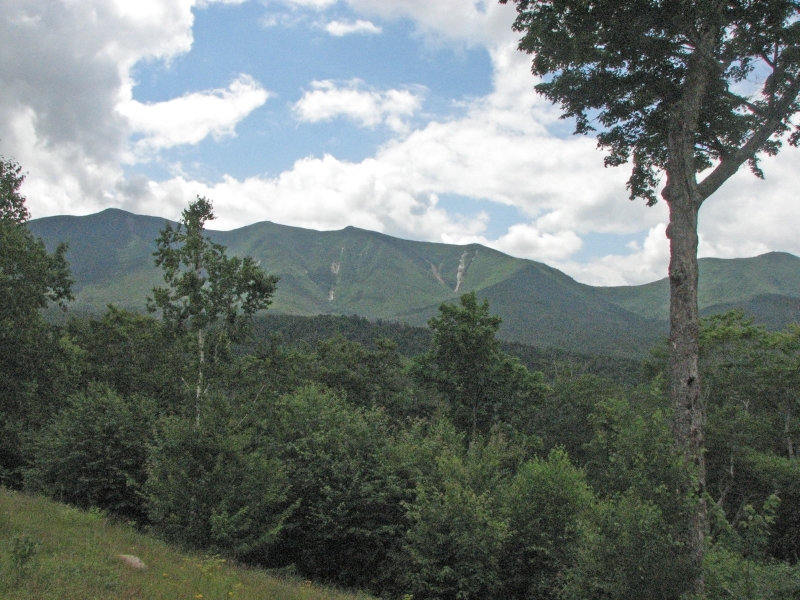 then drove a large loop around the White Mountains. It was a beautiful day, so the views were good of the cliffs and rounded ridges all around. The trailheads were horribly crammed with cars. I would have loved to go for a hike, but Jim’s foot is too painful for him to be interested in anything strenuous. You have to pay to park in the National Forest, so we didn’t even do a short hike. It’s not worth paying unless you plan to be out for a while. We did enjoy a big library book sale in Randolph, but not the craft fair in Conway that had traffic backed up for miles. We didn’t even stop because of the crowds. We ended up back at Moose Brook State Park. The campground was full (it’s Saturday) but we were allowed to use an overflow site across the road from the office. No outhouse, but it did have a picnic table and flat grassy area to park. Jim and I did an hour-long walk past the swimming area to the group area and into the woods. Friday we did a short walk in the evening. I miss doing real hikes, but at least the one and two mile walks keep me feeling fairly mellow. I was sorry to not take advantage of today’s good weather; it has been so rare since we returned to the east. July has been a cold wet month. We woke to gray skies, which soon turned to drizzle and then solid rain. 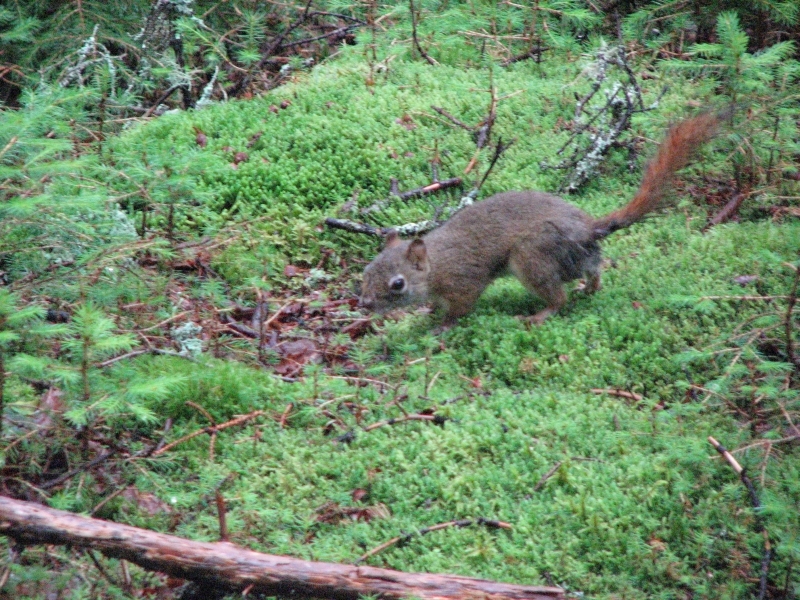 We met Red Wolf again in Gorham and dropped him off at his campground near the AT before the rain began. We decided it wasn’t a good day to view Mt. Washington, so instead of heading to Pinkham Notch, Jim and I just followed Route 2 east into Maine. We drove slowly, stopping for groceries, an oil change and other errands. 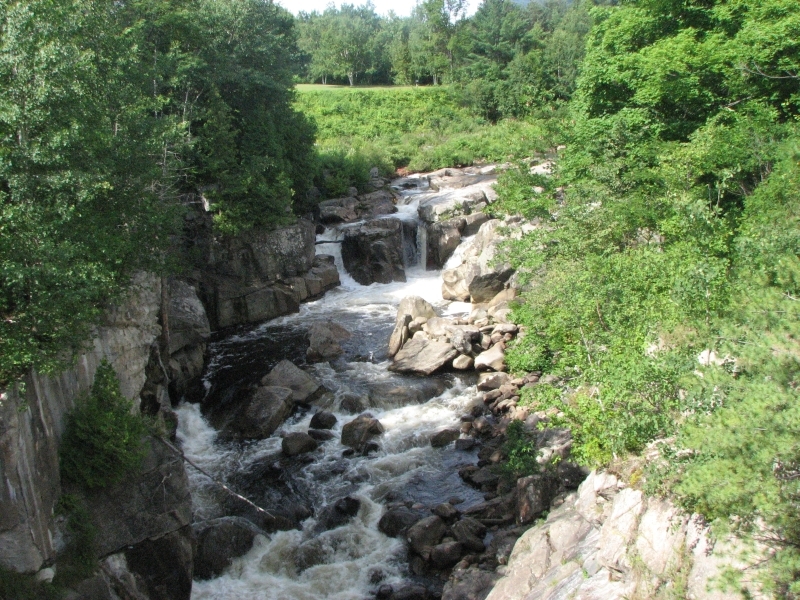 We got a good view of rural Maine: rivers and ponds, a nice waterfall in Rumford, pulp mills and small towns. This part of Maine isn’t very touristy, but there were a few nice Victorian houses and a lot of rundown old buildings. 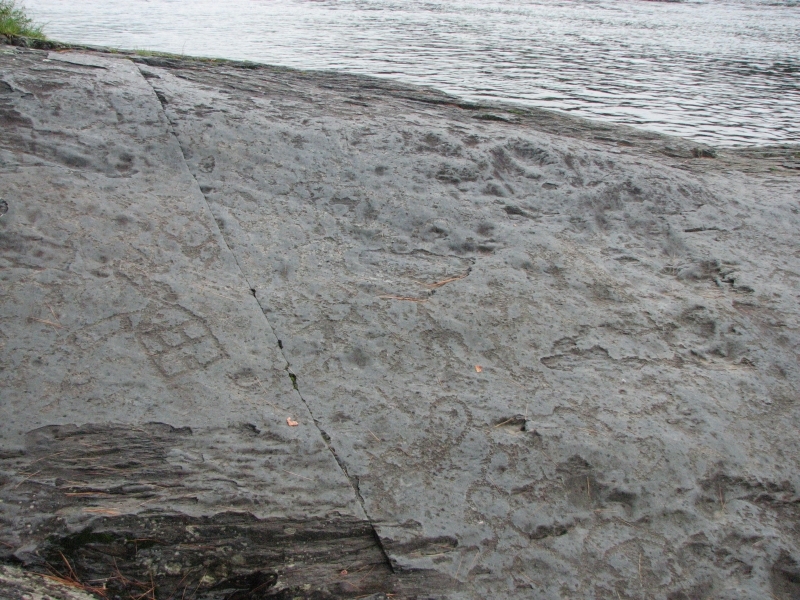 Late afternoon, we headed to a petroglyph site in Embden: a rock ledge out in the Kennebec River that is covered with carvings. The water has worn them away, but several were still quite clear. We got lucky in finding them. 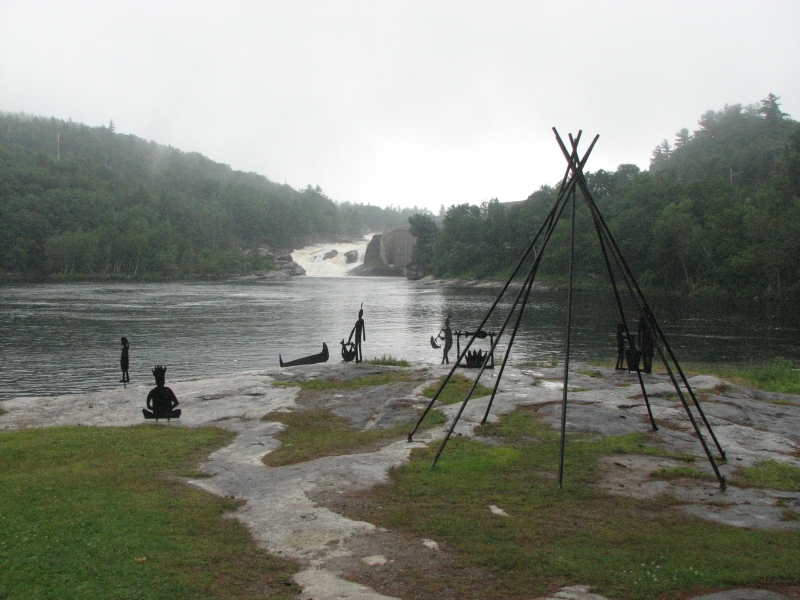 We stopped at a campground across the river (an archaeological site in its own right), and the owner was able to direct us to the path leading from the road to the Indian Ledge. It wasn’t obvious, so we were glad to have his directions. 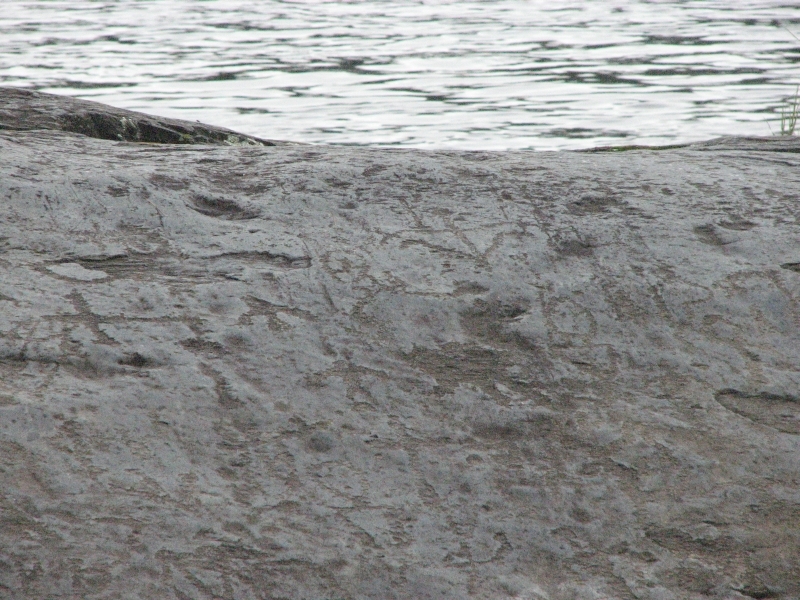 These carvings were more clearly authentic/older than the last ones, though, as usual, the dating is uncertain. A few of the petroglyphs were more modern, but most are presumed to predate the Colonial period, so are anywhere from 250 to 1500 years old. There were many human figures, a house, boats, maybe a turtle, etc. We returned to the campground, where I cooked dinner in the rain. We ate in the truck, listening to the rain sprinkling on the roof. I have decided to teach myself to knit. I learned the basics when I was about 12, but never got beyond straightforward knit - purl. WalMart had a book “Teach Yourself to Knit” so I decided to give it a try. We spend so much time in the car, it will give me something different to do while looking out the windows. Jim prefers to drive most of the time, and when we’re driving through the forest, there aren’t a lot of views. We listen to music and the college courses on tape, but it will be nice to have something to do with my hands. It rained hard most of the night and was still dripping when we got up. Jim suggested breakfast in town, and I happily concurred. It was wet and foggy all day, so we decided to just travel to Bangor, get a motel room and do town chores. After a couple of phone calls, Jim was able to get an appointment to see a podiatrist about his painful foot. The good news is it’s not broken and it’s not a Neuroma. The bad news is it’s Encapsulitis or Metatarsalgia and the prescription is rest and more rest. The doctor also sold him an insole that might help, but his main advice was to stop walking. Grrr! We also visited a used bookstore and three outdoor stores in a vain search for fuel for our camp stove. It’s an old butane model that works well but it can be hard to find fuel for it. Most camp stoves seem to be propane these days. We also learned that our broken cell phone is not fixable. Since we rarely use it, that’s not a major problem at the moment, especially since we’re heading to Canada where it might not be useable anyway. After dinner we finally returned to the motel to call the family and let them know we are finally on our way to Canada. Jim: The foot - has been a royal pain. I guess we should have seen it coming because I was having problems with that foot on the PCT. But sometimes you don't see what you don't want to see. And then there was the surgery - seems every time I have surgery something else (unrelated to the surgery) goes wrong with my body. And then, of course, I procrastinated about seeing a doctor about it. It's a male thing. The doctor didn't exactly "cure" the foot problem, but he pointed me in the right direction. That's all you can ask sometimes. So far this trip has had its interesting points woven into a lot of driving. The visit with Beau and Ninon was great, we've found a few petroglyph sites, done a little (too little) hiking and we've added to our knowledge of history. 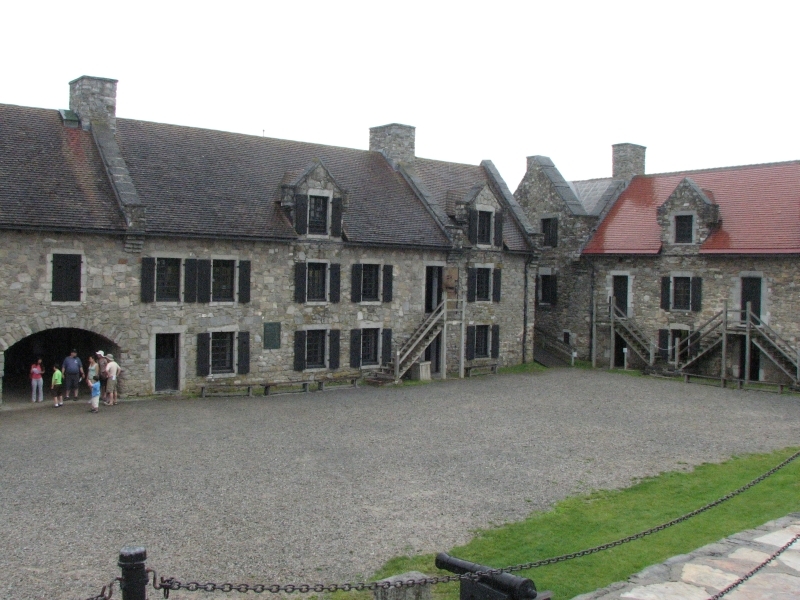 I haven't visited Ticonderoga and Crown Point since the kids were - well, small. And, oh my, how it's changed. And so have they. Nuff said about that. The days at Lewey Lake also took me back to when the kids were small. We spent a lot of time camping there with family and friends. Good times.